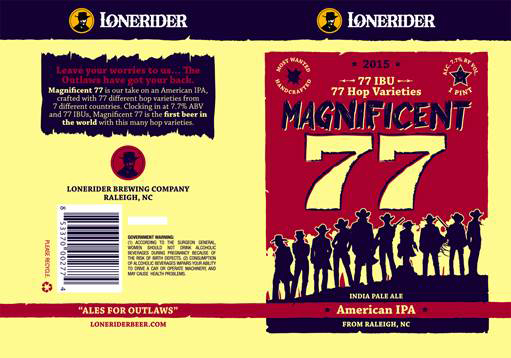 RALEIGH, N.C.—Lonerider Brewing Co., a craft brewery that prides itself on developing Ales for Outlaws, has announced the upcoming release of Magnificent 77 on July 18. The “Magnificent 77” is an IPA crafted with 77 hop varieties to create a one of a kind hop character. Featuring hops from 7 countries (US, UK, AU, NZ, Ger, Czech, Slovenia), different varieties are blended together to create a unique flavor for each of the 7 hop additions during the 77 minute boil. After fermentation, it is dry hopped by adding a different variety each day for 7 days, followed by 14 more varieties for an additional 7 days. Coming in at 7.7% ABV with 77 IBU’s, it’s a drinkable and flavorful IPA. For more information about Lonerider, please visit www.loneriderbeer.com, become a fan on Facebook or follow @loneriderbeer on Twitter. Lonerider opened its doors in Raleigh, North Carolina on January 23rd, 2009 with a beer and a dream. Today, Lonerider is distributed in six states and is counted amongst top 150 breweries in USA. An Inc. 5000 and CED Top 25 winner, with an eye for quality, Lonerider crafted each of its beers with the highest quality ingredients. As a result Lonerider has a portfolio of award winning beers, including medals from GABF.